I know, I know, I need to follow up on my last post on Y the Last Man, but for now, let’s put that on the back burner. Today, I’m going to look at Box Office Poison by Alex Robinson. But before we jump into that, I’m going to intro a concept. If you are friends with me, I might ask you to read and review something. I’ve picked my first two victims: my dad, and my sister-in-law. My dad is going to be reading a mystery comic, possibly something by Ed Brubaker and Sean Phillips. My sister-in-law is going to be reading the first volume of The Walking Dead by Robert Kirkman and Tony Moore. So, anyway, Box Office Poison. If I’m framing my recommendations in terms of movies, then I recommend Box Office Poison to readers that have enjoyed the work of Kevin Smith(the really good heartbreaking stuff like Clerks or Chasing Amy) as well as the films of Noah Baumbauch(Kicking and Screaming, The Squid and The Whale). In other words, indie drama films that concern themselves with slackers, intellectuals, or intellectual slackers. Box Office Poison is written and drawn by Alex Robinson. (File this away for a future piece: artist and writer teams versus singular writer/artists). It’s a story that revolves around Sherman, Ed, Stephen, and Jane, as well as their friends, family, and a collection of book store customers who grow dumber by the second. 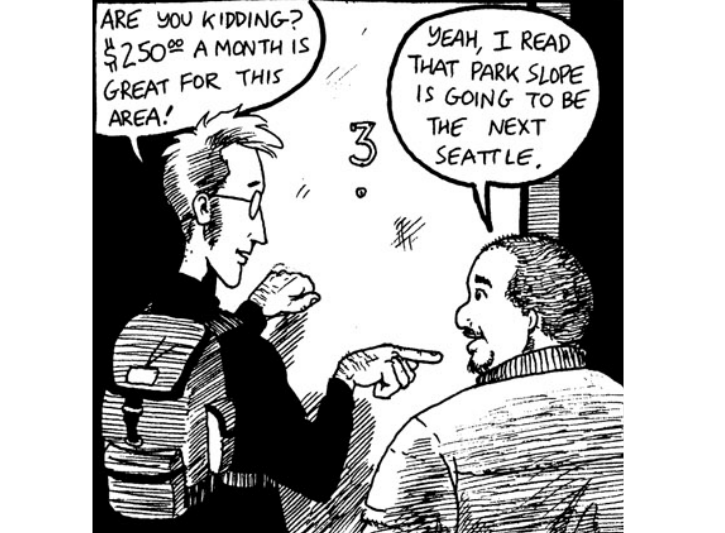 They’re all NYC-based creative types, Sherman wants to be a writer, but works in retail; Ed works for his father but wants to be a comic artist; Stephen’s a liberal arts professor; and Jane is also a comic artist, though she’s a little bit ahead of Ed. The main character is Sherman, though the focus does shift at times to Sherman’s best friend Ed, as well as Sherman’s roommates Stephen and Jane. Robinson also plays with that oh-so-difficult-to-deal-with aspect of comics, the speech bubble, in dynamic ways. Too often, I’ve heard people say “I don’t know which bubble to read first,” or “I don’t know which direction to read them in.” Well, to that I say, “Hold onto your butts.” There’s points in the book when Robinson is dealing with two characters meeting, or connecting with each other. 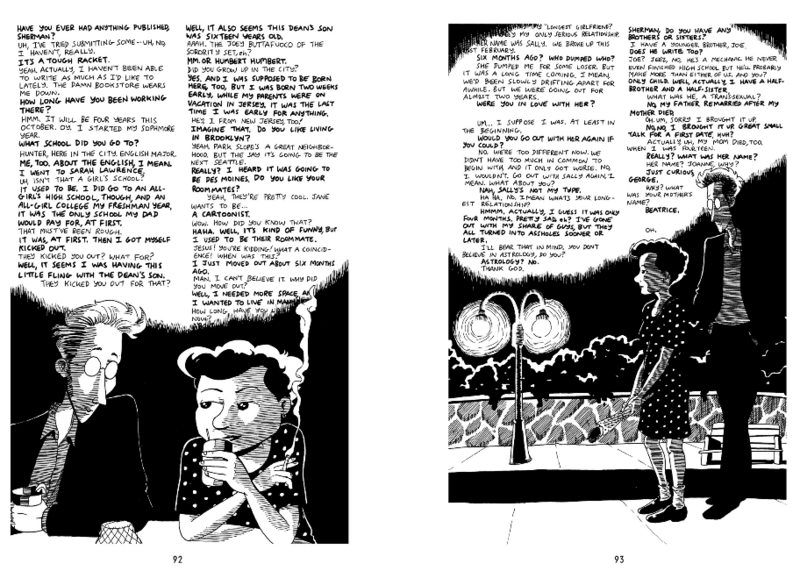 The above pages feature Sherman meeting his girlfriend Dorothy, and as the two get lost in conversation with each other, the reader does too. Sometimes, comics fall into the trap of trying to be movies or television, and then you’ll get 5 pages of talking heads that appear to have been copied and pasted with different dialogue. Here, the dialogue is condensed, and is allowed to fade in and out from page to page. It’s a great approach to storytelling and one that shows how the medium is separate from movies, from television, and from prose. So, why should you read this comic? You’ve worked in retail. You’ve said the phrase “I only read non-fiction.” (You turd) You’ve had your heart broken. You’ve pursued a dream. You’ve failed at that dream. How can you read this comic? You can buy it for $10 on http://www.comixology.com, and also check out a preview for free there. Or, if you want to read it in print, buy it on Amazon, your local bookstore or comic book store. It’s a bit pricier in print, but it is a huge honkin’ book. If you do read it, let me know your thoughts, as I’d love to feature them here. * If you read More Box Office Poison, which is basically a collection of deleted scenes, there’s a brief full-on biographical section about how Robinson met his wife and started publishing comic that seems to suggest he has been both Sherman and Ed at points in his life and career.